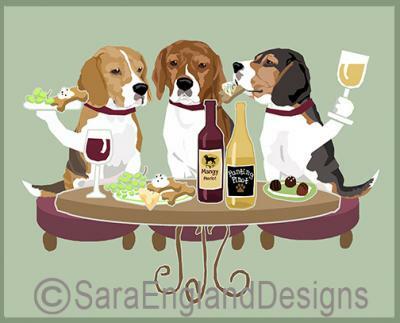 Beagle Dog's WINEing feature your favorite dog breed - the Beagle - sharing a glass of Wine with their canine friends! This is a fabulous print for the Beagle dog lover! Prints are available in 3 sizes and arrive double matted with a thin black inlay. Customers from Canada, Hawaii and Alaska should inquire about international shipping and delivery PRIOR to placing order.